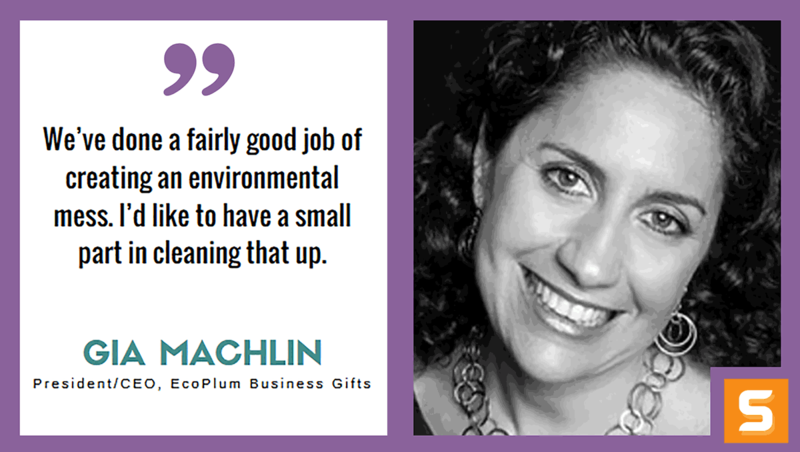 Gia Machlin is the President and CEO of EcoPlum Business Gifts, a company that provides eco-friendly business gifts and promotional items for corporations, universities, non-profits and private events. As a successful entrepreneur with a track record of building strong teams and lasting companies, she has a deep commitment to helping combat environmental issues through social enterprise. EcoPlum Business Gifts is an extension of EcoPlum, an online boutique and digital media company with a social mission. The EcoPlum Boutique sells stylish, unique eco friendly clothing, jewelry, cosmetics, handbags and gift items that are organic, vegan, upcycled, recycled, and/or Fair Trade certified. Gia and EcoPlum have been featured on Green is Good Radio, WOR Talk Radio, Crain’s New York, INC. Magazine, Café Mom, and in many other business publications. EcoPlum is a Green America “Gold” approved business. In this interview with Startup Savant, Gia shares her mission to use sustainable business products to help save the environment. She values the planet and people equally with profit. Her vision is to disrupt the promotional gifts industry with eco-friendly products of EcoPlum. Wherever you are, if you can avoid a lot of debt and office space commitments as you start up, then we think that is the way to go! For more inspiration about how to save the planet, follow EcoPlum on Twitter! How did you get the idea for EcoPlum Business Gifts? Is there something you wanted to do different or better than others? Sometimes opportunities seek you out. And so it was with EcoPlum Business Gifts. While we had always created occasional branded eco-products on an ad hoc basis at EcoPlum, our primary focus was on our e-commerce boutique for consumers offering sustainable fashion, accessories, and home products. A company found our consumer e-commerce shop online and really liked the office products we have, made from reclaimed wood. This company contacted us regarding the creation of a branded smartphone holder from this line. It was a solid order and they returned for additional products. This prompted us to think about offering businesses and other organizations sustainable promotional products. We believe we can source unique, interesting, even stylish products that can be branded but will be much better for the environment than the usual plastic and other wasteful products given away. We really want to make a significant positive environmental impact with EcoPlum Business Gifts. When we say we want to disrupt the promotional products industry and reduce the amount of plastic waste it produces, we mean it! As a triple bottom line company, we value our Planet and People equally with Profit. If we don’t succeed with any of these, then we are not succeeding as a company. I’d like to see a world in which every business looks at the environmental impact of its products and takes that into consideration when making decisions. If the government won’t regulate all the environmental externalities associated with business, then it’s up to the consumers and businesses to lead in the change. We are on the forefront of that revolution. In 5 years, I hope the name EcoPlum is associated with being a game changer for better environmental stewardship in the promotional products industry. What attitude/habits helped make you successful while starting EcoPlum Business Gifts? Every time I have launched a new venture, I’ve put heart and soul into it. I live, eat and breathe the stuff. What’s nice about EcoPlum Business Gifts, is that everyone knows somebody who orders promotional products for their company, school, non-profit, or even a private event. So when I’m out socially I’m also making contacts for my business. And people don’t seem to mind as they love the idea of reducing waste in this industry. Also, and I’m sure I am not the only entrepreneur who has said this, I LOVE what I do. My past experience has shown that this kind of passion translates into success. What makes EcoPlum Business Gifts unique from others? How did you find your competitive advantage? EcoPlum Business Gifts are sourced and made sustainably, using a wide range of criteria to ensure that. We only offer sustainable products, unlike many large companies that offer a few eco-friendly products in addition to their massive array of products, many which are made of plastic and end up cluttering our landfills. Because we focus on sustainability, we know and understand this proposition better than these larger suppliers. We have been offering sustainable products to consumers since 2008, so we understand their needs, concerns, and things they like. We think this gives us an advantage over other promotional products distributors. We are building our business plan for this segment now, after running our e-commerce business for consumers for about eight years. There is no particular template for writing this business plan—we have pulled from a variety of examples and sources. EcoPlum was my fourth business venture, so planning for EcoPlum Business Gifts has come from past experience. That’s a tough one, I’ve made a lot of mistakes. I’d have to say that my biggest mistake was going into business in the past with partners that didn’t share my values. Seems pretty obvious, but when you have a great idea and a product that’s in high demand and starts making you a lot of money, it’s hard to step back and say, do I really want to be “married” to these people? I found out the hard way: it never ends well. Of course this was way before I started EcoPlum. I’ve worked with like-minded people since I entered the social enterprise space. Is there a type of marketing that has worked amazingly for EcoPlum Business Gifts? If so, how did you stumble upon it? There is no silver bullet for marketing, just a lot of hard work. We believe the business gift market has great opportunities for us because companies really want to align their values with the promotional products they give away. We intend to build this business using a combination of marketing tools at our disposal, starting with marketing with old-fashioned relationship building, but then supplementing our efforts with key event participation, social media, advertising, etc. My key motivator is thinking about what kind of world I want to leave for my children and their children. We’ve done a fairly good job of creating an environmental mess. I’d like to have a small part in cleaning that up. Do you use any tools to keep your business finances under control? We are a very lean and mean – I mean nice – business. I work from home 3 days a week, we use co-working space for our meetings and on days we need to be together. We travel only when absolutely necessary and use all the great free technology available to us to communicate with clients across the country. Our whole team is passionate about our mission so they go the extra mile on projects. Most of our marketing is word of mouth so we don’t have a big advertising budget. Very organic. Clearly NYC is a great place to start a business, with all the resources available and all the wonderful organizations based here. We can definitely say this has been an advantage for us. But we built a national e-commerce site and are developing a national B-to-B promotional product and gift business. So we are not a NY-centric business. Wherever you are, if you can avoid a lot of debt and office space commitments as you start up, then we think that is the way to go!